Having work critiqued can be uncomfortable. This was a shock, especially for the club’s newer members. For some it provided the jolt needed to move their photography on. To take a greater interest in what happens after releasing the shutter to produce the final image. To investigate the depths and mysteries of applications such as Photoshop from which they had hitherto shied away. It was not the ideal occasion, then, to enter the photo above. It was a digital projected image competition and as soon as it came up, large upon the screen, both the judge and I saw it. 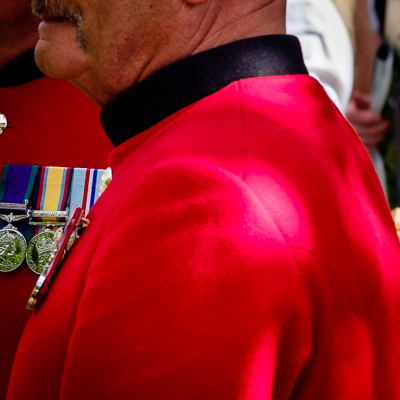 Two large areas of discolouration on one of the Chelsea Pensioner’s tunic. It was unmissable. So how had I missed it? How, indeed? First, I needed to find the cause. The lens was the obvious culprit. Well, you know what they say about inept workers. The lens fell under suspicion purely due to its provenance. A Vivitar 70-150 f/3.8, some 30 plus years old, bought for £24-95 including postage from eBay. Lenses designed for the film era do not always perform well on digital cameras. My initial thought that the discolouration might be due to reflection between the rear element and the sensor’s shiny surface. A quick look at the initial capture proved the lens had done its job. Admirably well. What had happened was down to me. I had processed the image in Lightroom and one of the application’s benefits is the History function, which keeps a persistent record of the adjustments applied. Even after closing the application, it is possible to step through the changes. The Vivitar was on a Fuji X-E2, which incorporates simulation of some of Fuji’s films when it creates JPEGs. The image started off as a Raw file, but Lightroom replicates those simulations. I had chosen to use the Astia/Soft setting and that is when the change in hue occurred. It was subtle on my monitor, hardly visible at all. Only once I knew where to look did it become at all noticeable. It was when I output the final image as a high resolution JPEG that it become really conspicuous. My error was failing to check that the final image matched what I was seeing in Lightroom. It had never been a problem previously so I did not bother. The message, which the judge reinforced, was that issues can arise at any stage; attention to detail is all. It was not just those new to photography who learnt some painful lessons that night. In the event, the shot achieved just 5 out of ten, which is about as low as it gets. To be fair, I had not expected it to do particularly well, but had hoped for a bit higher. 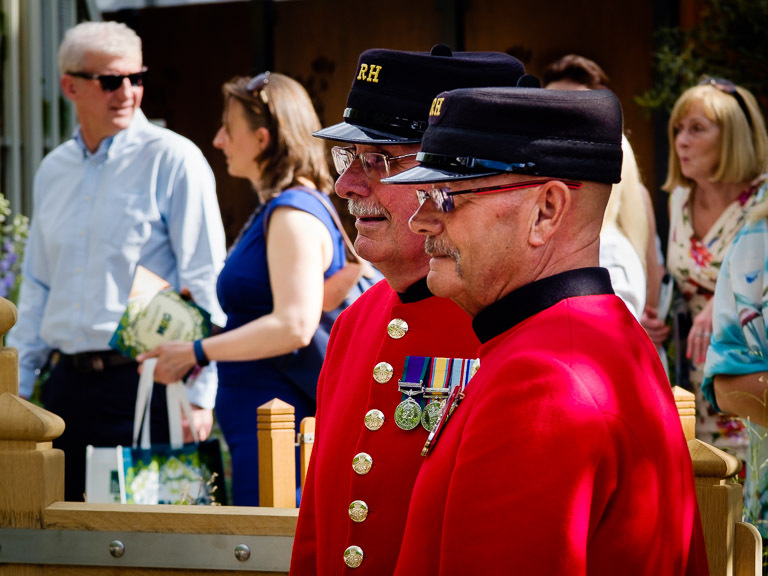 My club has a lot of competitions, with three images, mainly consisting of new work, for each and every one. It is not easy to achieve a consistently high standard in both print and digital categories. My preference is to reserve my best work for prints. I am there more to make up the numbers when it comes to digital. Apart from the discolouration, the judge did not like the expression of the woman on the right. I think it quirky and quite like it, but accept that it can be a distraction from the main subject. Some judges might agree with me, but competition is always a lottery. Based on the scores awarded to other images that night, it was always going to be an also ran. Even with perfect processing. This is the reprocessed shot. I changed the film simulation to Provia, which now that I look at it again seems a better choice and the colours are more realistic. More importantly, I did no experience the change in hue. There is dappled sunlight on the former serviceman’s tunic and it was two of those areas which were the root of the problem. To avoid any potential issues, I applied a local adjustment to tone them down. I shall not be using the image again, so it became just a learning exercise. Hopefully, it is not a mistake which I will repeat.